A rendering of the Easton Public Market, an indoor food market expected to open in early 2016 at the former Weller Center in Easton. Too often, redevelopment projects come with a negative stigma. But two Lehigh Valley redevelopment projects that are now coming to fruition completely defy those preconceived notions. Bell Hall, a new gourmet burger restaurant, opened its doors last month in the former Schoen’s Furniture Store in Allentown, a building once vacant for 20 years that has found new life as a loft-style office building with a mix of modern and historical architecture. 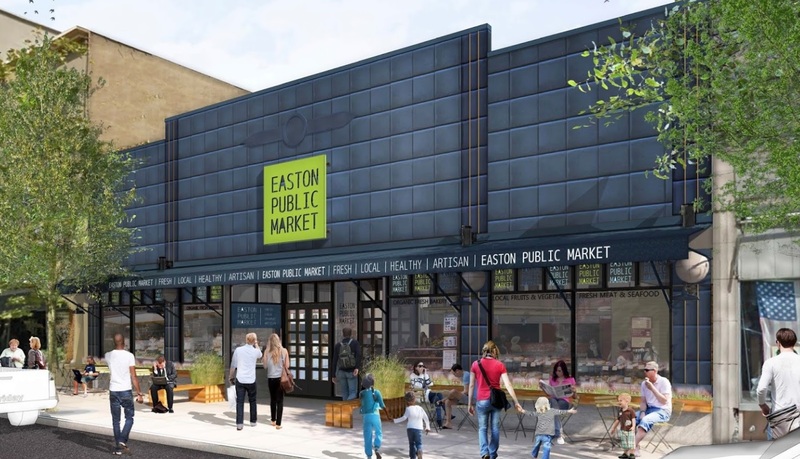 And the Easton Public Market, an indoor food market that will feature local vendors and serve as a vibrant cultural center for the community, is expected to open in early 2016 at the former Weller Center in Easton. Both of these projects received assistance from the Lehigh Valley Land Recycling Initiative (LVLRI), the redevelopment program of the Lehigh Valley Economic Development Corporation (LVEDC), and both are excellent examples of how the redevelopment process can transform a vacant or blighted property into an strong asset for the community. In the cases of both Bell Hall and the Easton Public Market, LVLRI assisted with a Phase I environmental assessment, and also helped with an asbestos and lead survey for the Bell Hall project, Kleiner said. Located next to the Liberty Bell Museum, the 303-seat Bell Hall offers 17 gourmet burgers and other options made from local ingredients, as well as an impressive craft beer selection. The 6,500 square-foot space includes exposed brick walls, refurbished hardwood floors, seasonal outdoor seating, and a 14-seat bar. The six-story former Schoen’s building at 612 Hamilton Street, now called the Trifecta Building, had been abandoned for 20 years before it was redeveloped by Charles Street Capital. Now it is the home of Bell Hall, Trifecta Technologies, Shane Patrick Associates, and an Offix Systems showroom, for a total of about 150 jobs in the building. “I strongly believe that redevelopment of vacant or underutilized property can not only be a cultural asset for a community but can also change the direction of that community,” said Jeff Brown, principal with Charles Street Capital. The Easton Public Market is a project of the Greater Easton Development Partnership, and builds on the success of the Easton Farmers’ Market. The project is expected to create about 30 jobs, according to Jared Mast, project manager at the Partnership. With 14 vendors already committed to the new indoor market, it will feature a butchery, fresh seafood, bakeries, artisan cheese, chocolatiers, noodle bars, craft beer, wineries, wood-fired pizza, crepes, barbeque, and locally-grown produce. The mission of the Easton Public Market is to create a public space to engage guests, spotlight local vendors, and enrich the community. Its vision is to develop a self-sustaining cultural and culinary hub that brings people together, supports a regional food culture, educates guests, inspires new ideas, and drives the local economy.